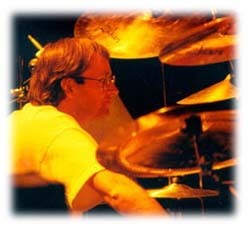 Drummer Dave Mattacks has been a long standing member of legendary folk rockers Fairport Convention, once in the early 70's and again as a member between 1985 until 1998. He has played on numerous albums including 'Nonsuch' by XTC. On tour with See www.dmattacks.co.uk - news / gig list, etc. Former : all the good musicians & writers I've been fortunate to work with over the years Latter : current state of the uk's "popular" music scene ( especially what's played on the radio ) - one of the reasons I'm here in the U.S.
3. Who have been the main influences on your career? 4. You left Fairport, after a sceond spell with the band in 1998. How hard was it to make that decision? 5. What was the highlight of the band during the 80's & 90's for you? The Cropredy festival each year. 6. Would you rejoin the band again, or is it just likely to be guest appearances at Cropredy from now on? 7. Back in the early days of Fairport, when did the band feel they may be about to achieve wider exposure and success? I personally don't ever recall thinking that. 8. What are your fondest memories of that time? 9. What has been the best career move you have made and why? I've never really thought in terms of " career moves " ,but certainly [physically] moving here to New England is a high point. 10. XTC - you appeared on the band's 'Nonsuch' album. How difficult was it to fit into the band, given that they are basically a two man band (Andy Partridge & Colin Moulding)? When " nonsuch " was made it was a 3-piece ( with Dave Gregory ) ; though it was challenging, it wasn't difficult - the experience was enjoyable - great songs ! 11. Did you provide input on the drum parts or did you play to pre- written music? Some drum parts were mine ( " My Bird Performs ", for example ), others had loosely defined demo' drum machine parts ( programmed by Andy ) which I used as "templates". 12. How has your style of playing changed through the years? My time & sound have got a little better & my "editing" has hopefully improved. 13. Can you hear your style of playing on any modern drummers at all? 14. What do you do in your spare time outside of music? Try to spend time with my wife Caron ! 15. Message for your fans?